Details: More than 100 years ago, Clayton the Cardician -- a companion of the great, great grandfather of Ellusionist's founder -- hired the U.S. Playing Card Company to create for him a perfect deck of playing cards. These cards would be printed on the finest stock available, and meticulously inspected with precision-gauge calipers to ensure razor-straight trim and balance precise to seventeen decimals. After spending six years and a tidy sum having these cards produced, the old gentleman accidentally dropped the cards down an abandoned mine shaft. There they sat until, acting on cryptic clues in a yellowing diary, Ellusionist's crack archaeological team uncovered the still-sealed deck of cards in mid 2006. The cards were yellowed and cracked but, incredibly, still flourish-worthy. In celebration of the discovery, Ellusionist had the cards duplicated in every detail and is now selling them to the general public. After experimenting with the recreated cards for some time, I find that they are much easier to work with than you might expect from something found in an abandoned mine. I also noticed that, by photographically memorizing the pattern of cracks on the back of each card, I could use this as a marked deck with no one the wiser. In fact, the only problem I found with the cards is that, due to their being copies of century-old pasteboard in every detail, you really can't use them for any trick invented after 1900. Oh, they fan just fine. 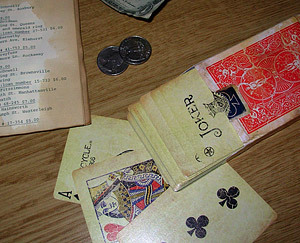 You can do a great riverboat-gambling routine with them, run through the pages of Erdnase, or do anything that sprung from the hands of Robert-Houdin or Hofzinser, but you're pretty much out of luck from Dai Vernon on up. I set these cards up to use the Osterlind Breakthrough Card System, but the results looked like nothing but a shuffled deck of cards. Forget about Card through Window -- these things bounce off glass like a drunken pigeon. I couldn't even do an Elmsley count with the things (not that I can do one with any other cards since I got the arthritis, but you get the point). So overall I'd say that this is an excellent deck of cards for more traditional magic. The "no new tricks" limitation isn't that big a problem considering how little there is in card magic that is truly new. And beyond that, the only other drawback is that, because Clayton the Cardician was killed in a cave-in while looking for his cards, the decks are also haunted. But if you can work that into your act and have a good rabbit's foot to counteract the ghost's fearsome curse, then you're golden.